Cow & Gate growing up milk 4 can be used as a milk drink in combination with a healthy balanced toddler diet. Your toddler will need about 300ml of Cow & Gate growing up milk per day as part of a healthy balanced diet. 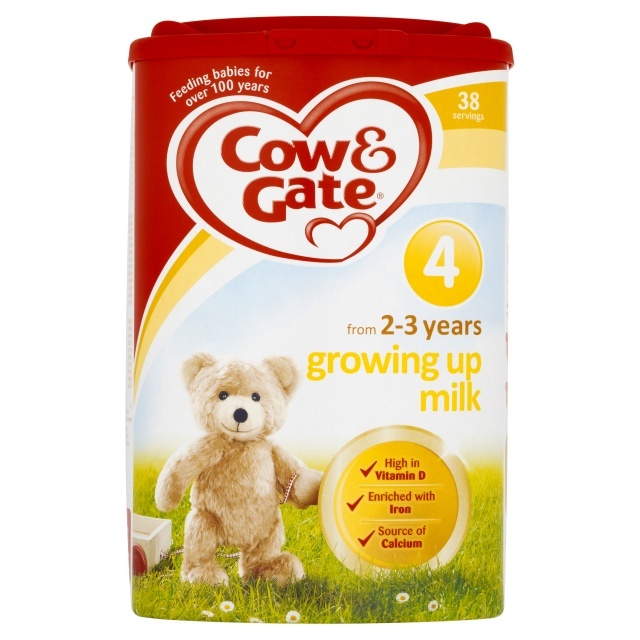 Cow & Gate growing up milk 4 is specially formulated to help meet the nutritional needs of toddlers. Your toddler may need more or less than the feeding guide above. This information is given as a guide only. † 1 scoop = 4.0g. Always use the scoop provided. The colour of the scoop in this pack may change from time to time. To open: remove tamper evidence strip on the rim of the pack. There is a handy leveller built into the pack to ensure accurate dosage every time. Press the hand icon and click the lid securely shut to keep your powder fresh. 1 Measure 150ml or 5fl.oz of cooled boiled water into a clean beaker. 2 Using the scoop provided, add 5 level scoops of powder into the beaker. 3 Mix well for 10 seconds to dissolve powder. Replace clean lid on beaker. 4 Check temperature and feed immediately. For hygiene reasons, do not store made up drinks. Discard unfinished drinks as soon as possible and always within 2 hours. If necessary offer cooled boiled water between feeds. Hot spots may occur and cause scalding. Use powder within 4 weeks of opening and store in a cool, dry place. Do not refrigerate. Make sure your toddler's teeth are cleaned after the last feed at night. Do not allow prolonged or frequent contact of milk feeds with your toddler's teeth as this increases the risk of tooth decay. Ask your healthcare professional or dentist for advice.